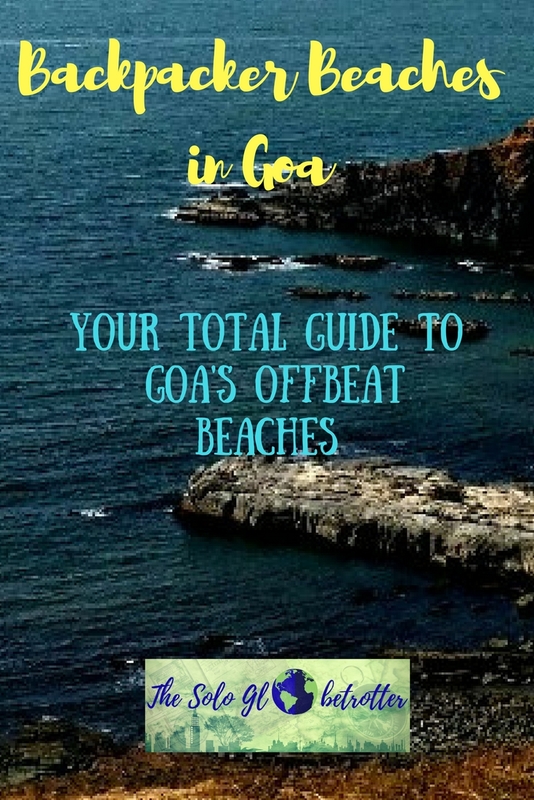 In this post, I have prepared a complete guide to the backpacker beaches in Goa. Having explored Goa so many times and in all possible ways – with family, friends, and as a solo backpacker, I have experienced Goa in different ways. 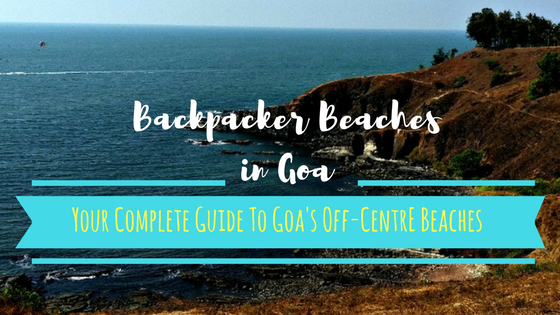 So I’m sharing all the backpacker beaches in Goa, the ones where backpackers – solo or not, can travel slow and experience Goa albeit the main attractions. the second kind of beaches for those travelers who want to move away from the tourist-centric beaches, and also don’t want to explore the party circuit/ nightlife of beaches but just want a quiet place and a piece of beach for themselves – for hermit kind of souls, you get it right? Do note that I have not included any of the mainstream, touristy beaches in this guide. Morjim is one of my favourite beaches in the North. The reason being it’s a secluded beach as compared to others.. I think this is slowly changing, though, and is on its way to becoming popular. What to do: Morjim beach has gentle waves, and the coastline is pretty. It’s a good place to play on the beach, take a stroll or laze on the shacks grabbing your favourite book and beer. 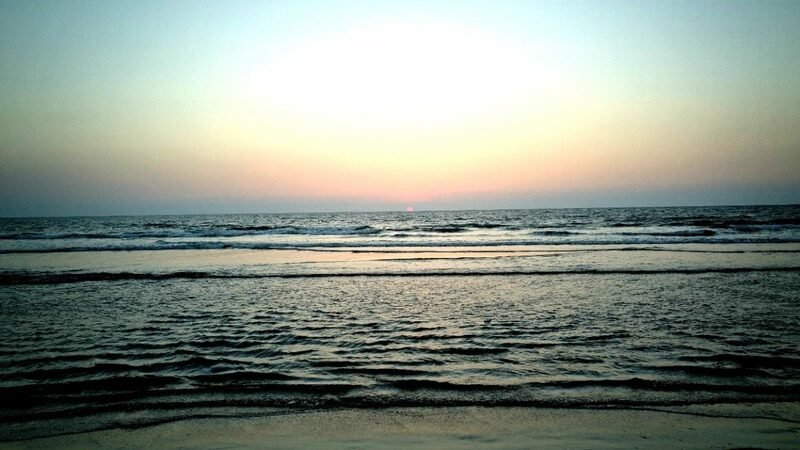 You can quietly watch the sunset too at Morjim beach. 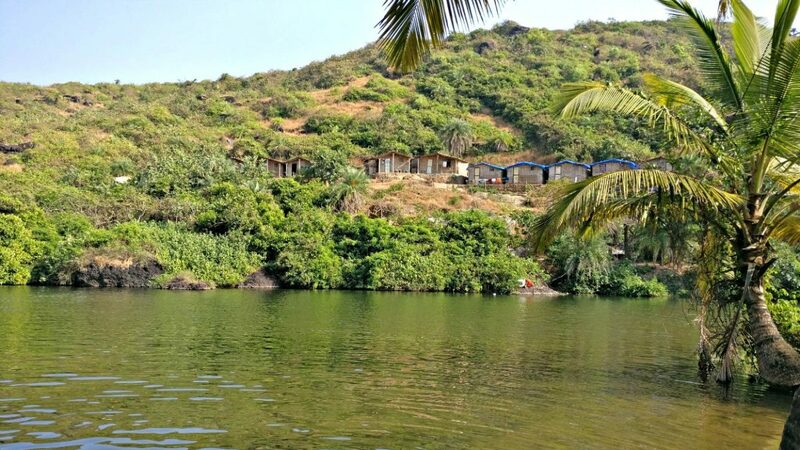 Where to Stay: There are quite a few hostels if you would like to base out in North Goa. I stayed in Wanderer’s hostel and it was a great experience. It’s close to the beach (10-minutes drive). Good Budget Hostels: These are some of the clean hostels under 500 INR with good Wifi close to Morjim. Ashwem is a quiet beach on the other side of Morjim and is also the place where river Chapora meets the sea. This delta looks very scenic and you can walk for long over the narrow stretch to see this. The place is especially picturesque from the bridge that comes when you get close to Ashwem. Look for viewpoints while driving to Ashwem. You’ll get a lot of good views of the backwaters and the delta. What to do: Ashwem has a lot of shacks to chill by the beach. You can also experience the backwaters of the delta depending on the season you visit. Mandrem is one of the less-visited beaches in north Goa, and it has a serene and a beautiful landscape close by. What to do: It’s one of those beaches to spend a quiet evening. There is a small hill which can be climbed for a good bird view of the horizon. Arambol beach, located close to Morjim is the one that I like the most. The beach attracts the maximum number of hippies, and the crowd that you see is totally different. Neither too crowded nor too quiet, this place has the perfect mix. 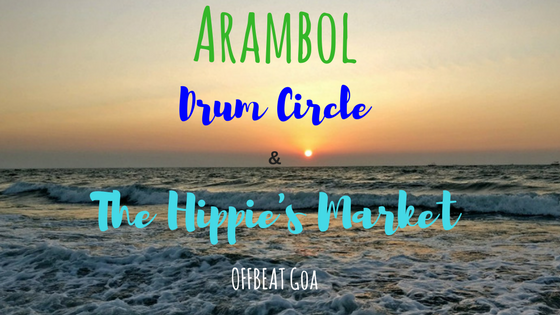 What to do: The best and the main attraction of Arambol is the drum circle. Visit Arambol just when the evening begins and watch the musical and dance performance in the drum circle. You can even join the circle with other hippies, expats, travelers and local and spend the sunset. Take a stroll along the beach and check out the hippie’s market, a lane of shops run mainly by expats, hippies and backpackers. Shop for unique items including rare artwork by the artists. Try the various herbal drinks in the market. Where to Stay: You can either choose to stay close to Morjim or close to Arambol, as they are not far from each other. There are some hostels for the backpackers. If you move ahead of Arambol, you reach Kalach beach, a small beach coast that can’t be accessed by road. You can reach Kalacha by walking beside the shops next to the shore from Arambol beach. What to do: Kalacha beach is mostly a hidden beach, thanks to its inaccessibility. Which also means that you can have your beach time here, playing or relaxing. However, the most popular attractions are the sweet lake and paragliding. Just a little ahead of Kalacha beach, there is a backwater opposite to the shore, which is widely called as Arambol’s sweet lake. The water is not very deep and is perfect for swimming. You can find many people swimming here during the evenings and the weekends. There are a few shacks as well nearby. Also, from the hill behind the sweet lake, people do paragliding. Where to stay: On the hill behind the lake there are a few guest houses that you can get for a cheap price. You can directly walk-in and book with them. The best option is to stay in one of the recommended hostels in Arambol and check out Kalacha as a day trip fro there. Querim is the northern most beach of Goa, located close to the border of Maharashtra. Located at a few kilometres away from Fort Tiracol, Querim looks more like a private island beach due to its secluded location. What to do: Querim or Keri beach is a perfect place to have a lazy beach day if you prefer to spend time on the beach. Check out Fort Tiracol, one of the major forts of Goa for the gorgeous bird view of the Arabian sea from the top of the fort. Go out on a bike drive in the hills nearby, and enjoy the views from the banks of river Tiracol. You can go on a boat ride or watch fishsermen fishing on the boats. Where to stay: The closest and the best place to stay to explore Querim is from Arambol or Morjim. Because one of the best things about Querim is the long drive to the beach itself. However, if you like to indulge in a luxury stay, you can stay at Fort Tiracol itself, which has been converted to a beach hotel. All of these beaches are mostly visited by the backpackers and people who love arts, hippie life, music and a light night life. Now, coming to the second part, if you want to experience beaches and nature moving away from the crowd, there are a few beaches in the south, until the south border of Goa. The major town from where you have to drive to these southern beaches is Agonda. I have made this list in the order that they appear approaching from Agonda. I could not visit this beach but I have heard that it’s a small and beautiful beach from the locals. Do check out and let me know! Palolem is known to some, and it’s one of the cleanest beaches in South Goa. The tides are not very high and the beach is smooth. I had a great time playing on the beach while I was here. A great place for an evening to enjoy. Canacona is a town close to Karnataka’s border and there are a few beaches that are hidden away from the tourists. I actually got to know about them when I met a local and asked for unexplored beaches in the extreme south. I could not explore these on my last trip but I have the names for you. Talpona, Galgibaga and the prettiest one is Mashem, it seems. Let me know how you like it if you visit these beaches! Are there any other beaches that you have explored? Let me know in the comments, I’ll add to the guide. Tell me about your experiences beach. 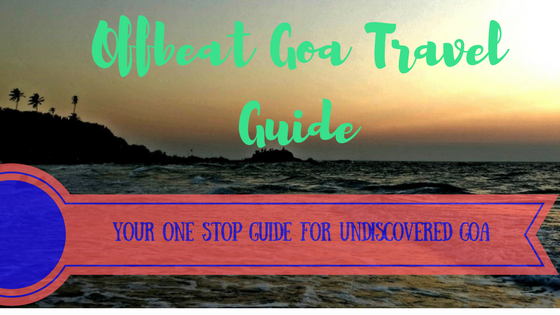 Read and share this guide for your next offbeat trip to Goa!